If you’ve never read any of Taylor Branch’s three volume social history of the American civil-rights movement, now might be the time. 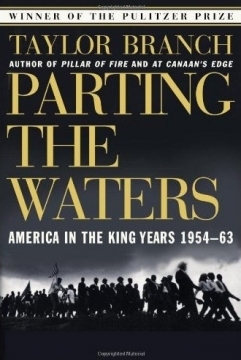 Parting the Waters: America in the King Years 1954-63, At Canaan’s Edge: America in the King Years, 1965-68, and Pillar of Fire: America in the King Years 1963-65 are award-winning, exhaustive histories of Martin Luther King Jr. and the momentous battle for civil rights for African-Americans. The first book, Parting the Waters: America in the King Years 1954-63, won the Pulitzer Prize and the National Book Critics Circle Award. via To Be Read – Monumental trilogy of the American civil-rights movement.